Though for some, Wesak appears to be a Buddhic practice, it is universal in nature. People from various backgrounds, races and religions gather together every year to take part in this great act of service and to receive the tremendous amount of spiritual energies and blessings that pour down on earth to accelerate their spiritual development. Believed to be the most powerful full moon of the year, Wesak meditation is conducted on the exact time of the full moon of Taurus. Based on a legend, every year at the exact time of Wesak, Lord Buddha comes down and pours forth the spiritual blessings and energies of the divine. Christ as the representative of the humanity receives the blessings and distributes them to the humankind. In this way once a year during the Wesak festival, a renewed spiritual energy and life is transmitted to the humanity and to every person and every being on earth, which marks a great point in the life and development of people on earth. The effect of this moment of intensive spiritual effort and invaluable service believed to last throughout the year. 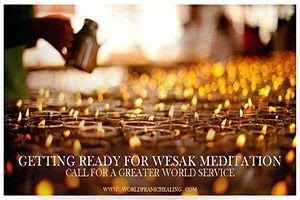 Meditating during Wesak both benefits the individuals and the whole humanity to help manifest the Divine Plan on earth. Therefore many spiritual practitioners, disciples, Arhats and Masters prepare themselves well ahead to participate in this great act of service through days of intensive purification and meditation prior to the actual meditation. Without thorough purifications and preparations, the Wesak meditation will not create the expected effects on the practitioners, as the body is not prepared to receive the blessings. In fact the 5 days of Wesak festival are crucial! It is believed that during these 5 days very special energies, emanating from the Heart of God, through the Lord Buddha, the Lord Christ, and the Spiritual Hierarchy, flow into human consciousness and are poured forth upon planet Earth. These energies are greatly magnified by focused group meditations and provide an opportunity for spiritual growth. 2 days prior to the actual meditation is the time of purifications, self-healing and preparing the system to be able to receive the intense vibrations released during the Wesak meditation and to remove any negative thoughts and emotions in the aura that might hinder the usefulness of practitioners as channels of spiritual force. 2 days after the Wesak is considered the time for distributing the received spiritual energies to every person and every being on earth. It is therefore highly recommended for all the spiritual practitioners to prepare their systems and hold an attitude of dedication, service and receptivity that enables the Hierarchy to use them as more effective instruments. Master Choa Kok Sui. (2004). Beyond the Mind, The Golden Lotus Sutras on Meditation. Institute for Inner Studies Publishing Foundation. Leadbeater, C. W. (1927). The Masters And The Path. Bailey, A. (1971). Esoteric Psychology II. Bailey, A. (2011). The Externalisation of the Hierarchy.